Hulu’s Live TV service could be on the chopping block following the massive Disney-Fox deal. That’s because Disney will suddenly have control of a pay-TV service, even as it does business with a slew of other pay-TV offerings. Plus, a “skinny bundle” package may not be a priority for Disney given its direct-to-consumer subscription plans. “It’s still a bit early right now to determine fully what direction we’ll take that,” Disney CEO Bob Iger said of Hulu. Hulu’s fledgling live TV service could be the first casualty of the massive Disney-Fox deal. Anything seems on the table given the size and scope of this deal, which has many moving parts. One big, immediate outcome of the transaction: Disney now controls a majority of Hulu, which has long operated as a joint venture between Comcast’s NBCUniversal, Fox, and Disney. 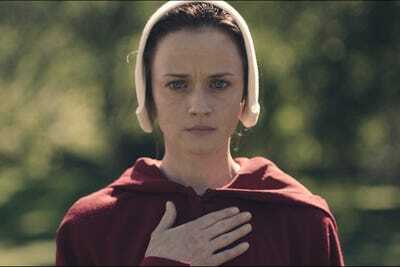 That’s led to lots of speculation about what happens next with the streaming service, which lags far behind Netflix in terms of subscribers but scored Emmy gold this year with the buzzy drama “The Handmaid’s Tale.” Some have speculated that Disney could use Hulu as a launchpad for its planned subscription streaming service. But CEO Bob Iger indicated today that he sees Disney’s soon-to-launch streaming offering aimed at families, while Hulu could cater to more an adult and serious-drama crowd, reported Deadline. “We’ll have the ability to direct Hulu in ways that we haven’t been able to, as essentially equal partners,” said Iger on CNBC Thursday. Meanwhile, Recode’s Ed Lee said Hulu could essentially outlive its usefulness over time and simply just go away. Somewhat overlooked in this discussion is Hulu’s $US40-a-month cable-TV alternative. Recode says it has roughly 250,00o paying subscribers. It was one thing when Hulu was a joint venture. Now that Disney’s in charge, is a pay-TV skinny bundle a strategic priority, particularly when Disney seems so focused on taking on Netflix with its new stable of Fox studio properties? Moreover, Disney could be forced to get rid of Hulu’s Live TV offering, Rich Greenfield, BTIG media and tech analyst, told Business Insider. That’s because Disney will both be looking to sell its programming and networks to other “skinny bundle” pay-TV services like Sling TV and YouTube TV. Owning and controlling its own skinny bundle in Hulu Live could open up Disney to anticompetitive questions. “While Disney is a minority owner of Hulu, moving to majority owner would likely increase its incentive to harm competitors,”Greenfield wrote on Monday. Therefore, to make sure regulators don’t find any reason to fight the Fox acquisition, Disney could simply elect to kill Hulu TV, or maybe sell it. “If Disney were willing to shutter the [Live TV] portion of Hulu, it could cure the potential vertical antitrust concerns,” Greenfield wrote. But it’s complicated. Comcast, which also owns a stake in Hulu, will likely get to weigh in on any big Hulu decisions. In the past Comcast didn’t have a say in how Hulu was operated – which was part of an agreement made with regulators when Comcast purchased NBCUniversal roughly a decade ago. Would Comcast want to keep Hulu TV alive? Buy it? Hard to say at this point. And Disney CEO Bob Iger probably has a long list of things to work through before he gets to this decision.